Please refer to our stock # TC258 when inquiring. 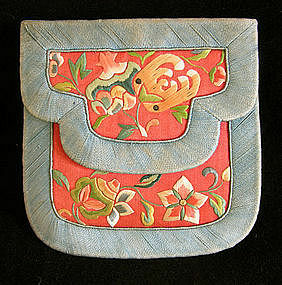 Made and used during the late Qing Dynasty, the quality of the materials and workmanship clearly show that this purse was used by a woman of means. Unfortunately, this use has left some wear patterns and some areas appear faded which would be expected in an embroidered piece of this age.